My sister recently had a couple friends over for a little Greek BBQ. On our trip to Greece last year we took a cooking class with Eleni (see link at the end of the post for some of her other recipes) and have been pretty much obsessed with the food since. Anyways, we made spinach pies (or Spanakopita) and we ended up with a LOT of left over filling. 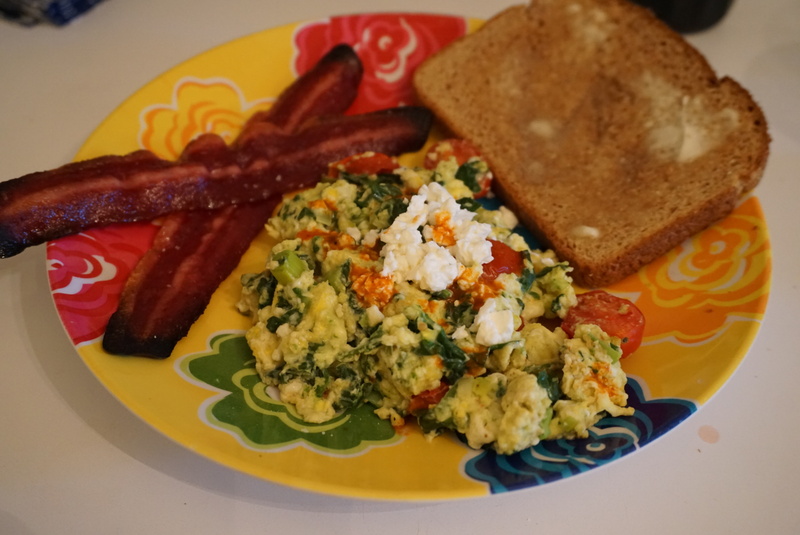 Rather than wasting it all, we decided to freeze it and the next morning I used some for this delish scramble. 2) Put the spinach, leeks, green onions, and dill in a large mixing bowl. Add the olive oil, salt and pepper, and begin to “knead” the mixture until all the spinach has been broken down and is wilted. 3) Add the feta cheese and lightly beaten eggs. Mix everything together to create a uniform filling. Put the mixture aside. 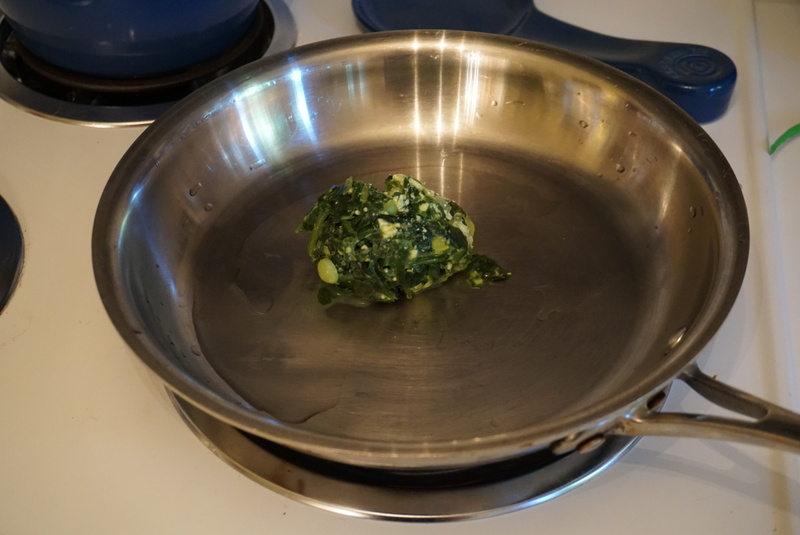 4) Heat up a skillet and place the spinach mixture in the pan to begin sauteing everything. 6) Add your beaten eggs to the pan and scramble as they cook. I used 2 beaten eggs. Spinach mixture cooking in with the eggs and tomatoes. 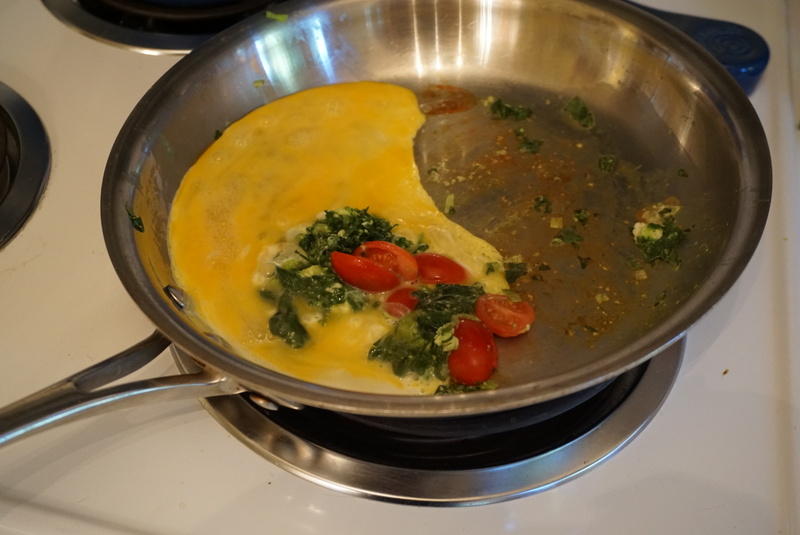 7) Continue fold the eggs until the spinach is mixed in and the eggs are completely cooked. 8) Place your cooked eggs on your plate and sprinkle with some additional feta cheese! For a little extra spice add your favorite hot sauce :). 9) Add any additional items you would like to complete the meal – for example, I used turkey bacon and a piece of wheat toast. You could also add a fresh fruit salad or homemade potato hash! I love this recipe and think it is a unique way to use leftovers. You can easily replicate this with a variety of leftovers. 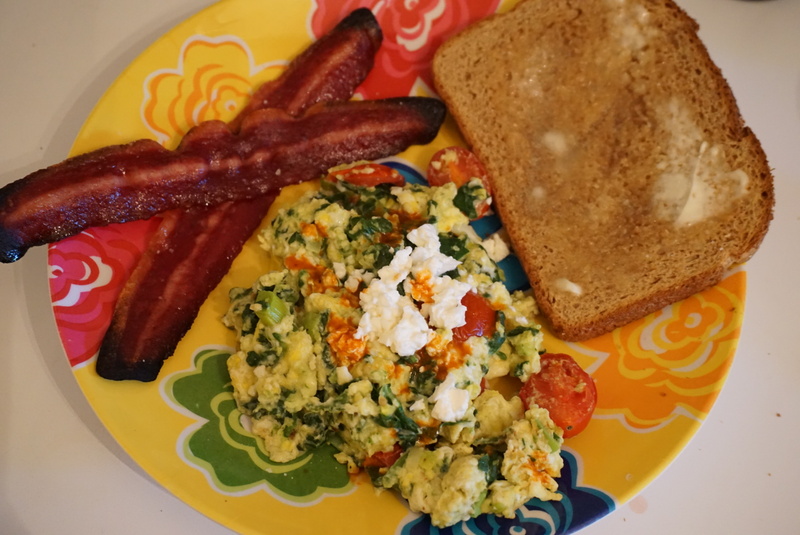 Who doesn’t love a delicious egg scramble filled with flavor – feel free to get creative! I hope you enjoyed the post and are inspired to try out some new food!